spacefm file viewer (094), upgrade pack one, user experience tweaks. i think it will be the last that sees separate upgrades and releases for both versions as most of the size difference comes from packages that continually upgrade (wine, libreoffice, java, etc). version2013 already has the 1730 package available--i just downloaded wine 1729 about a week ago, it seems. anyway, that package is available in the wine folder of the repo. install as is if p573, either the sfs or the sfs right-click converted to a pet. (props to don's right-click suite). for those who have p573-L, you'll need to uninstall three packages with the ppm--wine1729doc, wine1729dev, and wine 1729 itself. you can then extract the contents of the sfs and install the three newer, similarly titled pets. or let it be, i guess. next update probably won't be too far off. i could use some clarification. you mean i open those two files (say, with geany) and find the "precise-5.7.2. "es there and change the names to something like p573 (or anything other than "precise-5.7.2") and no one will have any problems? also, if someone's already installed 572, they'll also have no worries as the installation will just let it be? Is a bit ( ) more complicated but basically, yes. DISTRO_FILE_PREFIX is the variable that determines the savefile (and some other things). If you change DISTRO_PUPPYSFS and DISTRO_ZDRVSFS you have to change your SFSs accordingly. A final important variable is the DISTRO_IDSTRING that must be added at the end of the puppy sfs and the vmlinuz so init can find them. 'echo -n "$DISTRO_IDSTRING" >> puppy.sfs' will do that (path, name and string must be adjusted for actual). Make sure you type ">>" and not ">"
The DISTRO_SPECS file should be identical in initrd.gz and the main sfs. So make one as you like and copy it over to the other. thanks. next version uploaded will have that addressed. well, not quite. couldn't figure out how to get the code to work. figured out a couple of ways to edit the initrd directly (by extracting it twice, which seemed a bit odd, and through woofy), and it wasn't that hard to get to etc/distrospecs, but i was unclear about what to overwrite with what. there seemed to be a mix of precise571 and 572 references and i didn't want to risk breaking up some sort of internal look up or referral string, so i basically chickened out of messing with it. so it's still in function an upgrade of precise rather than a distinct entity. for the smaller of the two isos, i think woofy allowed some sort of suffix before the final ".sfs," but i doubt this will affect much. update of possible interest: new palemoon browser by OscarTalks available in repo. Bad news first. The "small" iso will not boot because of the name change. Init is instructed through DISTRO_SPECS to look for "puppy_precise_5.7.2.sfs" but the sfs in the iso is named "puppy_precise_5.7.2p574p.sfs". No good. Regarding editing the initrd, here is how to do it. Hope is clear. #note: prior to existence of this variable, online subname was set to $DISTRO_COMPAT_VERSION or via some hack code. Feel free to change it but the actual sfs names must be the ones you put in DISTRO_SPECS. If you change the string make sure that is 32 characters and no spaces. thanks for the clarification, mavrothal. and the heads up regarding the smaller iso. i had misgivings when i filled out that slot--it should have said "you can append something here, but it will screw things up for you" instead of just opening up the possibility. well, quicker to fix the smaller one. at least in theory. I was having trouble getting the nvidia driver i added to 574-L to work correctly on a dual screen setup (think i should've included the glx version (OscarTalks) if at all), so I made p5741, which is the same as p574 but with palemoon 25.02 in place of the sea monkey suite, and the addition of the latest wine (1.7.30--thanks to version2013), qt-4.8.2-stripped (i believe thanks to pemasu), jre-1.8u25-i586.pet (thanks to gjuhasz), and dropbox-2.10.28 (thanks to nilsonmorales). 277mb, and basically an upgraded 574-L minus the aforementioned driver, Hydrogen (drum machine, thanks to scabz), LibreOffice (4.3.4 available in repo) , Ardour (Digital Audio Workstation, scabz and RSH), and VLC (the 117 by RSH, the 214 and 215 by OscarTalks, and the 205 you can get through 666philb's quickpet all work). to /root/my-applications/bin and name it "ppo," you can add it to the menus using the above templates, which could also be used to add any other program or script to any of the root menus, including the main one (/_root_.jwmrc) in /etc/xdg/templates. template is a good way to compress them down to one line/pipe menu slot on any of them. folder containing the isos: p574, p575, p57577, which also includes gz-compressed versions of each iso's main sfs file. all the isos start out with the default applications from precise 5.7.1 minus abiword, osmo, planner, rubix, and emeraldia. p575 and p57577 further removes homebanking and the sea monkey suite (though i wouldn't be surprised if it hung around--saw at least one residual file on one of the isos, though that could've been created by the pale moon installation, since that's also a mozilla product…). when the isos are made, i go back and recompress the main sfs as xz, which saves about 20 percent off overall size but gives a time penalty of similar magnitude. i've uploaded gz-compressed sfses for the three isos--if you're not using a live cd or dvd and don't need the ~ 50-200 mb savings, it may be worth it to swap out the xz compressed sfs for the gz compressed one (you can also do it yourself through uextract and parchive available in rox's right click menu) for the quicker load time (once the programs are running, there's no performance difference). they're in separate folders named for their respective isos and include the gz zdrv file--just decompress the folder and swap (you can also convert your installation to either of the two other varieties this way). (hopefully a more concise version of the distro details already discussed and hopefully a reminder to myself to test load times at various compression levels and sizes). edit: deleted the outdated, alternately compressed SFSes as rufwoof's investigations address the issues i raised and more. contains two examples (one for firefox and one for palemoon) of how to get a browser entry on a menu to open a specific site (add more sites separated by a space if you want it to open multiple tabs when launched), but i'm really including it here for convenience. it's a bunch of stuff i find myself reaching for fairly frequently, so i put it on the left click menu, and then just about all the menus, since it's only one line and why have to remember which if it's basically everywhere. changes in the menu require a jwm restart to show. changes in the root 3 menu (the little dog/right click/main menu) require fixmenus entered into a terminal and a jwm restart. the following are not all included in these releases, but have started to look something like a supplemental network/places menu (i'm pretty clueless about networks and so have just mainly used cloud synching to move stuff between my machines. anyway, i'm starting to become interested in it...), and could also conceivably be of use to someone. flashblock and adblock work really well--once you get used to having them you'll likely never want to run a browser without them. the two links to here are nice, the two search engines possibly redundant. if you make it a script, you don't need to add all that code to the root#menu to give it an entry--just the name of the script once linked or copied to /root/my-applications/bin. this has the further advantage of instant response--changes to the script don't need jwm restarts to take effect. you can set most programs to open multiple files in this way. the gif shows the five mouse menus (well the version that didn't include the shot beneath the htop window did ) and the two extant trays. the image is from a google search of winter and isn't posterized/impressionismized in its original form--the poor quality monitor i'm using plus the reduction setting i used in making the gif are the reason it looks as it does. it contains icons (copy or symlink them into /root/puppy-reference/mini-icons) and two versions of the menu. personally i prefer the one in the PlacementPack2.readme. 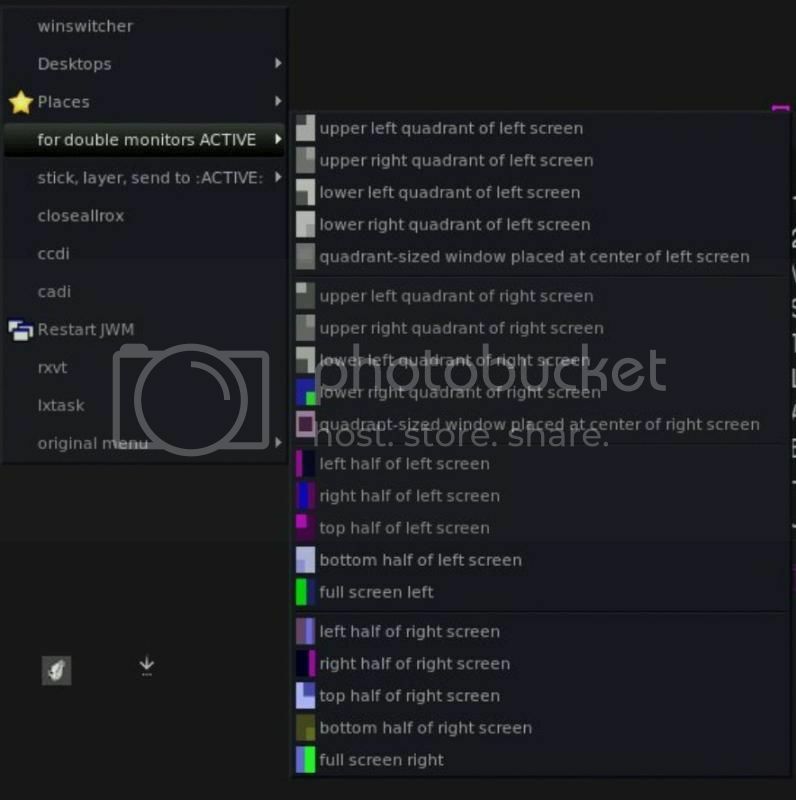 you get ten placements/sizings for single monitor setups and a twenty for duals, each of which is doubled to account for a choice of instant (menu item (or shortcut key) works on active window) or click (you get a cross hair which will act on the next window you click) activation. the scripts are largely already in /root/my-applications/bin, but one or two may be newer or new. you can just copy the lot and overwrite any conflicts. or decline to. it shouldn't matter much. it also allows you to do layers, send-tos, and stickies with your choice of either instant (active window) or click (cross hair) activation. added is ~572. Whitesnow's upgraded dbus has been added to allow for easy installation of her mydropbox_1.2.pet. the installer for pale moon has been added to the first folder in root (i think i named it "0_check here to install pale moon browser_0") so you can have something up to date, lightweight, and fast. 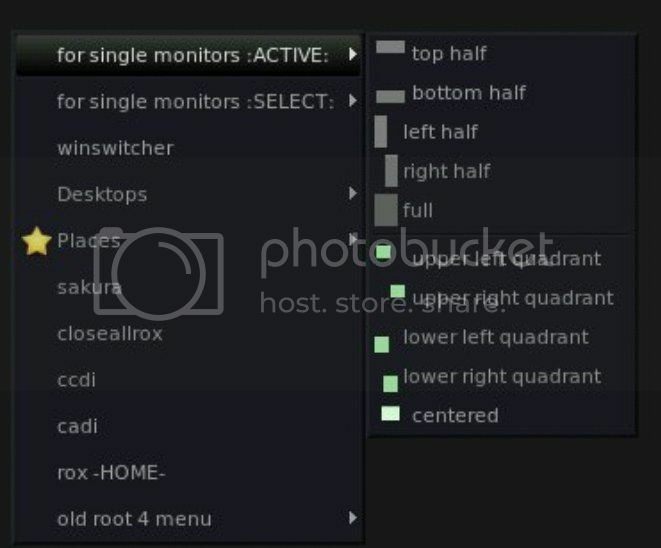 the interface has been changed to one similar to this, but with 24 desktops (three rows of eight) instead of one row of ten. i like the idea of keeping the OS elements out of your way, and noticed how much more real estate you get for the task list this way, so i figured why not pile on the desktops, since the pager in its new position is pretty unobtrusive. 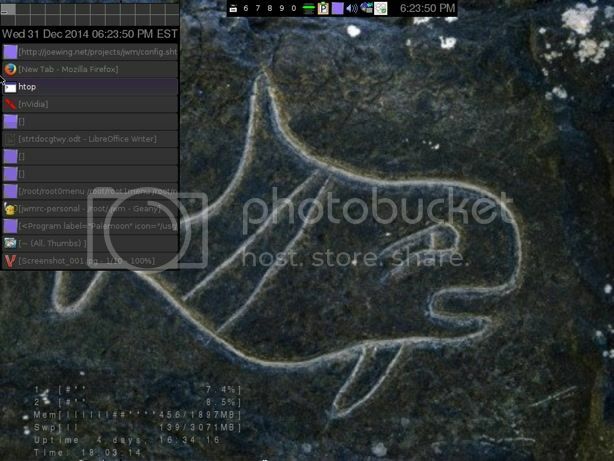 turns out anything over 24 is a problem for the <desktops/> tag and send to menu on a little netbook screen so that's the upper limit as far as built in navigation (d1-d24 in a terminal send you) terminal/menu tweaks. change the line in jwmrc-personal to get desktop arrangements beyond the 5 by 2 offered by the gui. the trays autohide and there's no longer a bottom tray, but you can get it back by uncommenting (remove the <!-- and -->) out the <!--<Include>/root/jwmrc-tray</Include>--> line in jwmrc-personal. it's set to be just a task list moved over to the right a pixel (so you have five mouse menus accessible on the far left instead of just root:3/the right click one), but you can get the original back by renaming the 0jwmrc-tray file in /root. 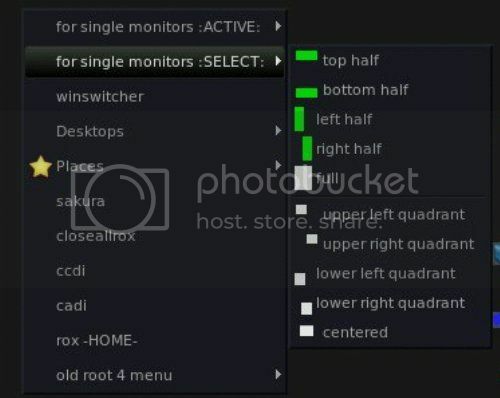 other changes are the further fleshing out of the other nine root menus, particularly with respect to the addition of the windows resize and move entries. also, to have all linux partitions automount by default, you'll need to move the the mnt-all-three script from the quar folder in Startup to Startup itself and click it/click it and move it to the Startup folder. to get the roxrefresh (bookmarks on the the menus) script to work, you'll first need to bookmark some folders in rox and then click the script. to jwmrc-personal (works when using the htOPuRXVT script in Startup or Startup/quar). to change the color of htop's fonts and set the transparency, use urxvtset. upped some screenshots of the (wmctrl-dependent) move and resize menus. it shows active and select for dual and single screen setups. i will upload the the additional sendto :select: scripts for the terminal shortcuts when i up ~573 and ~574. 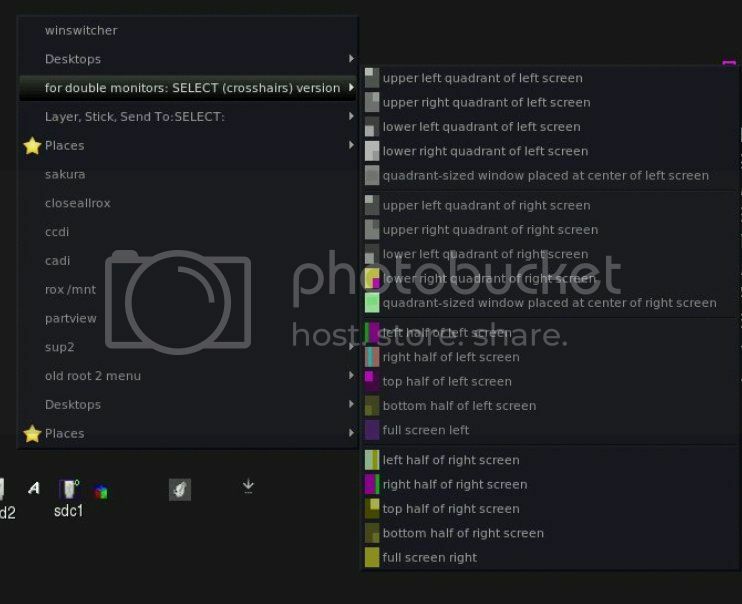 despite what's written in the geany doc in the dual monitor shot, the stock geany setup for this series is actually document tabs across the top and not down the right side, possibly because a right click gives you the list vertically. in place of the originals. wine installation went smoothly with the w1734.sfs (pets by version 2013), so i decided to check out portable apps. turns out kompozer works fine, which makes me feel that removing the sea monkey suite wasn't such a big error. there's also a portable app version and shinobar has a portable linux version, though that may be without the html editor, etc. anyway, the next two (~573 and ~574) will have wine 1734 and a browser preinstalled, either palemoon 25.1 or firefox esr 31.4.
to install: copy menu to a root menu and the scripts to /root/my-applications/bin. requires xdotool (preinstalled in these pups). conversion can be done online or with full fledged word processors. variety of things an array of places is to just have the folder with the send-tos open and click back and forth...sticky and layering scripts could come handy in those circumstances so they're included as well. 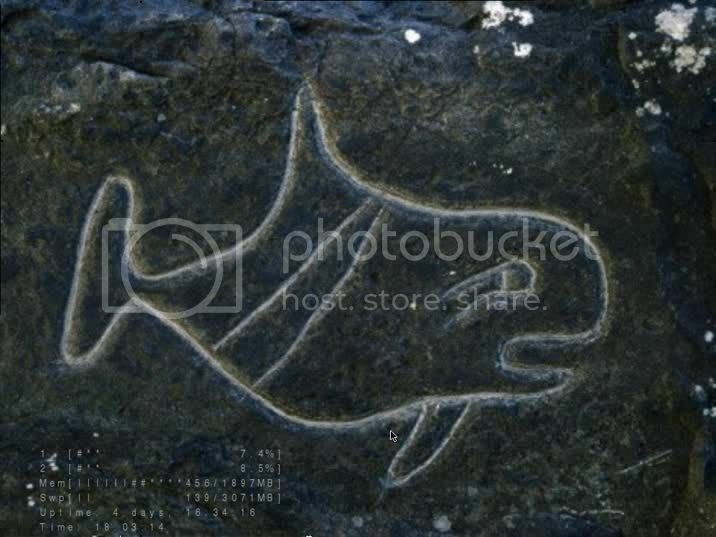 #this is the one known as other--use this for most things. #this is the one the menu calls poetry. only what's between the two body tags is seen by word processors and browsers. # the pre setting will preserve all your skipped lines and blank spaces--fonts and all that can be edited later in a real word processor. #this is hard to beat for speed and document access though. xdotool type "`xclip -out -selection clipboard`"
copy to /root/my-applications/bin (overwrite what's there). now the scripts that paste the codes and the scripts that surround selected text with the codes are in separate menus separated by a help file, which doubles as an easy way to launch geany. i foresee the central area of the menu growing with the edition of some preformatted tags (automatically format all <p>aragraph or <pre>formatted tags or present the css templates that will allow you to do it yourself). i'm not sure if other distros are similarly affected, but the newest libre office doesn't appear to create desktop or menu entries in any of these precise spins or my regular precise 5.7.1 install. sfs and pet both exhibit the problem. here's 435, which doesn't require any workarounds. edit: i may have overstated the menu problem. turns out an extra "fixmenus" entered into the terminal fixes it. there weren't any desktop entries created in usr/share/applications the first time around, even though they all exist and were created properly in /opt/libreoffice4.4/share/xdg/. if you are experiencing the lack of menu problem even after running the extra, manual fixmenus, it may be easiest to just highlight the icons in /opt/libreoffice4.4/share/xdg/ and drag them to usr/share/applications, choosing "create symlink" from the menu that pops up. you could drag icons for the start center or component programs from either of those two folders to the desktop if you'd like traditional icons and a way to launch from the pinboard. fixmenus, restart jwm.